During the years between World War II and the establishment of Israel in 1948, three Jewish para-military organisations were operating in Palestine. 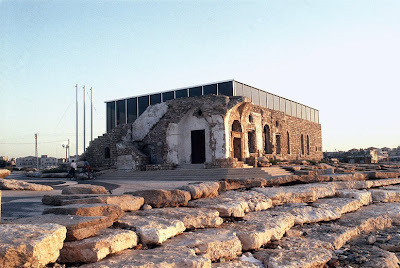 The first one to emerge was the "Jewish Defense Organisation", the Haganah, which was founded when the tensions between the Palestinian and the Jewish population started rising. Until 1929, the Haganah was relatively loosely organised and poorly armed, consisting mainly of untrained Jewish farmers who protected the Jewish settlements against attacks from Palestinian Arabs. The year 1929 saw the first large scale escalation of violence between the Palestinian and the Jewish population in Palestine, during which an estimated number of 133 Jews were killed by Palestinians and 110 Arabs were killed by British police. 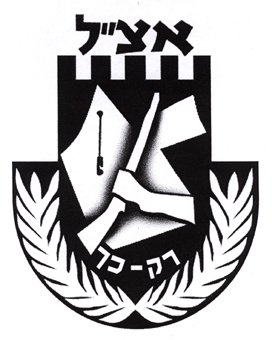 In the aftermath of the riots the Haganah grew into a much larger organisation, soon consisting of tens of thousands of members who became more engaged and organised in acquiring foreign arms, as well as manufacturing their own simple weaponry; the untrained militia was thus transformed into a capable underground army. With increasing tensions between Palestinians, Jews and also the British army, a number of Haganah members soon felt that the organisation's official policy of "restraint", of only defending the Jewish communities, rather than launching counterattacks against the Palestinians, was too defeatist and they formed the "National Military Organisation in the Land of Israel", known also as Etzel or Irgun. The Irgun emblem, showing the map of all Palestine. 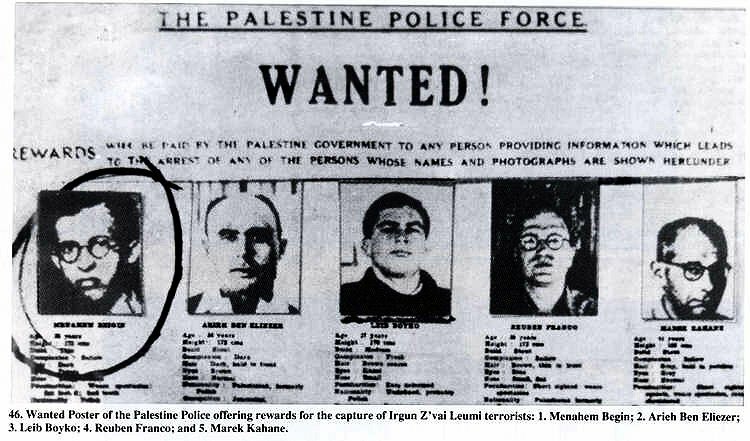 The Irgun had its roots in the Revisionist Zionist Betar youth movement, founded in Latvia in 1923 by Ze'ev Jabotinsky. As opposed to Labour Zionism at the time, Revisionist Zionism was striving for the establishment of a Jewish state on both sides of the Jordan, and further propagated that only force could liberate the homeland. In 1937 the Irgun therefore started retaliating upon the Palestinians for the attacks on Jews, and started attacks on Palestinian civilians. The British did not stand by and in 1938 Shlomo Ben-Yosef became the first Irgun fighter to be executed. Until 1939 most of the attacks against Palestinians were reportedly not coordinated with the Irgun leadership and were mainly carried out by individual groups from within the movement. The majority of the Irgun members at the time was still occupied with the defence of Jewish settlements, and with building underground cells in Europe which would participate in organising Jewish migration to Palestine. With the publishing of the White Paper in 1939 by Britain, which ordered a prohibition on selling land to Jews and a severe limitation of Jewish immigration to Palestine, the Irgun started targeting British infrastructure, as well personnel of the British army. The subsequent outbreak of World War II however changed the focus again and the Irgun suspended its activities against the British and publicly announced to support them in their fight against German Nazism. Some members of the Irgun under the leadership of Avraham "Yair" Stern, who saw "no difference between Hitler and Chamberlain", split from the movement and formed the third para-military group, "Lehi", the "Fighters for the Freedom of Israel", usually referred to as the Stern Gang. Between the years of 1937 until 1939, the activities of the Irgun together with those of the newly formed Lehi, claimed no less than 232 victims and 370 wounded, including women and children. During the war various Irgun members joined the British army and assisted them in intelligence operations abroad. The uprising in the Warsaw Ghetto was also to a large extent organised by members of the movement as well as by Betar members. After four years of war, and millions of European Jews being massacred by the Germans and their allies, and the White Paper still being in effect, the Irgun, now under the leadership of Menachem Begin, who would later become one of Israel's Prime Ministers, decided that the British were striving "for the destruction of our people's last hope", and declared that the ceasefire was over and resumed their attacks against the British. In response the British started expelling hundreds of arrested Irgun and Lehi members to detention camps in Africa. The Jewish Agency, fearing to loose the support of the British, started a "hunting season", carrying out surveillance, kidnappings and investigations of suspected Lehi or Irgun members and turning them over to the British authorities, or providing them with information about their whereabouts. After the end of World War II the British continued their policy of severely limiting Jewish immigration to Palestine and now even the Jewish Agency, through the Hagannah, unofficially started supporting sabotage acts against the mandate government. The famous bombing of the King David Hotel in Jerusalem in 1946 by members of the Irgun, which resulted in the deaths of 91 people, most of who were not British, was actually also a way to hide the Jewish Agency's link to the newly formed Jewish Resistance Movement, which tied the Irgun, the Lehi and the Haganah together in their fight against the British. In 1947 the unsolved issue of Palestine was brought before the UN for a final decision, which established a special inquiry commission. Thinking of this as just another way to delay the foundation of the Jewish state, the para-military groups stepped up their activities against the British. In April 1947 one of the Irgun's largest operations took place, the Acre Prison break which allowed 41 members of the underground movements, along with others, including 214 Palestinians, to escape. 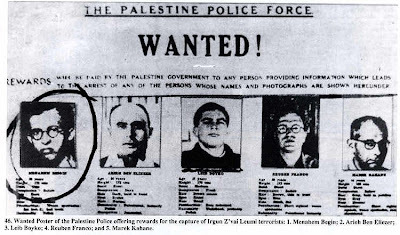 When three of the members, who carried out the operation were caught and sentenced to death, the Irgun retaliated by kidnapping two British sergeants. Approximately 13 hours after the three Irgun members were executed, the British hostages were found dead, hanging from trees and booby-trapped with explosives outside of Netanya. This "Sergeants Affair" is commonly referenced as one of the main events influencing the decision of the British government to end the mandate and leave Palestine. In November 1947, the UN General Assembly voted in favour of ending the mandate and establishing two states in Palestine. The day after, the first stage of the 1948 War began, when Palestinians reportedly started attacking Jewish communities. During the war, the Irgun fought alongside the Lehi and also the Haganah, which by then had dropped its policy of restraint completely. The Irgun is held responsible for many attacks on Palestinian towns and villages, the most notorious one being the assault on Deir Yassin, where 100 to 120 civilians, including women and children were massacred by members of the Irgun and the Lehi. The spreading of rumours of the events in Deir Yassin are often held responsible for the mass flight of Palestinians which ensued shortly after. The Irgun itself prides itself mainly for having single-handedly facilitated the conquest of Jaffa in April and May 1948, during which 90% of its Palestinian population fled and never returned. The Etzel Museum, located in one of the only two remaining buildings of the Jaffan neighbourhood of Manshiyyah at Tel Aviv's southern shore, commemorates this victory, and painfully pays tribute to the eradication of a whole neighbourhood. After the establishment of the State of Israel on May 14th, 1948, the Haganah was transformed into the Israel Defense Forces (IDF) and all other military organisations, including the Irgun and the Lehi were supposed to be absorped into it. Although the Haganah engaged in terrorist activities, and was responsible for the deaths of many civilians as well, it was never criticised as fiercely. The activities of the Irgun and the Lehi on the other hand, were condemned severely, and its members called terrorists, including by Jewish organisations, such as the Jewish Agency, the Haganah and the Histadrut themselves. Notwithstanding those charges, many members of both movements later became legitimate leaders, presidents and prime ministers of the State of Israel. The Irgun's ideology, Revisionist Zionism, which at the time was considered by Labour Zionists too hawkish in its principles and approaches, eventually constituted the precursor of today's ruling Likud Party of Benyamin Netanyahu. It is ironic that Israel continuously plays the terrorist card against the Palestinian leadership and other Arab countries, in order to legitimise its military actions, or its refusal to enter negotiations. At the same the state retrospectively sanctioned and glorified the activities of its very own terrorists, but as the saying goes, "one person's terrorist is another person's freedom fighter".